Chickpea flour is still new in my kitchen, but the fact that it is gluten free, grain free and has a higher protein content than regular grain flour makes me want to explore all possible ways of cooking with it. I admit, I am still in the trial and error phase. Some disaster experiments included, but that's fine. Sometimes you have to learn things the hard way, right? For instance, I got hold of a delicious sounding apple cake (yes, CAKE) made of chickpea flour. As a lover of quirky ingredients, that was something I had to try immediately. Well, the cake turned out more chickpea-y and not very apple-y. Nothing that you would want to have with your afternoon tea. After a little research I think I found out what went wrong: there is two types of chickpea flours out there. One is made of white European chickpeas, the other one (usually used in Indian cooking) is made of the brown chickpeas and is called besan. I used besan, a flour that already smells quite strongly of chickpeas when you open the package. I was a little in doubt that a couple of apples and some honey could override its strong flavor. As I suspected, they didn't and the savory chickpea taste remained in the cake. I can only conclude that the original recipe was to be used with the European white chickpea flour. I still have to find this particular chickpea flour in Dubai to get final confirmation. For now, I can only confirm that besan flour goes very very very well with savory recipes. 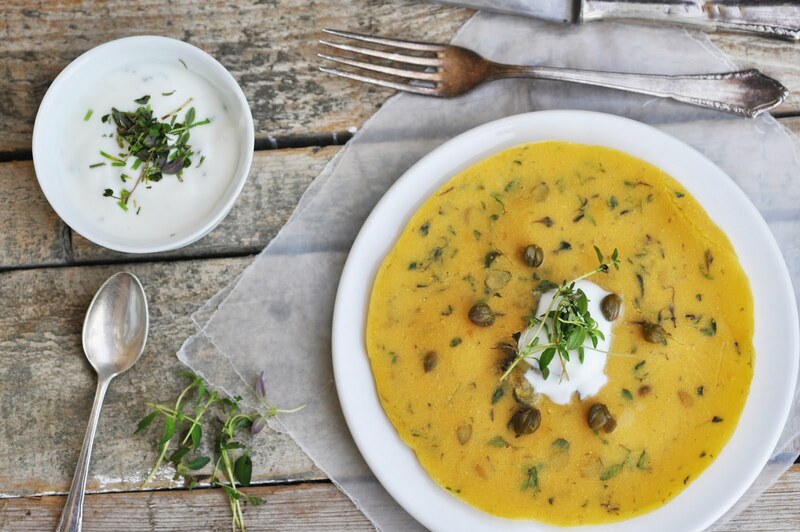 If you like chickpeas, you will definitely like this: herbed chickpea pancakes. They are vegan, full of flavor, and very filling. I spiced the batter of my soon to be chickpea pancakes with fresh herbs, capers and black olives. Try and cook these pancakes as thin as possible. Then spread a generous dollop of refreshing herbed yogurt on top and eat them immediately. I have just one word for this: addictive. In a large bowl, sift together chickpea flour, salt and herbs. Add oil and water and mix until well combined. The batter should be runny, but not watery. Add chopped capers and olives. Lightly grease a large frying pan over medium. Pour about 1/4 of the batter into the pan, and shake it so the batter spreads evenly and thinly to all sides. Turn heat down to low and cook until pancake is cooked through and solid, and just slightly browned underneath. Grease pan again and repeat with the remaining batter. Serve immediately with a dollop of herbed yogurt. In a medium bowl, combine all ingredients. Stir until well combined and smooth. Ready to serve.